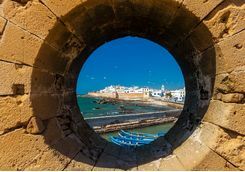 Starting in the gateway to Africa, Tangier, this 19-day adventure takes you on the ultimate tour of Morocco. 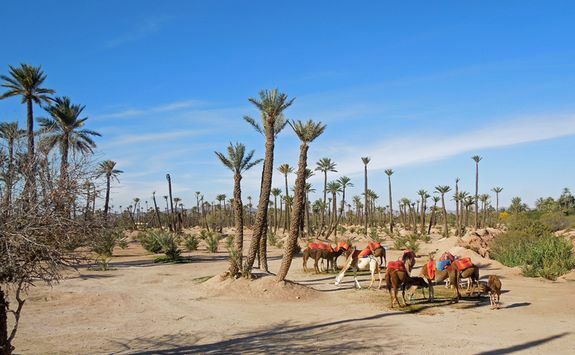 Along the way you'll do everything from desert camping to pottery making and mountain hiking. 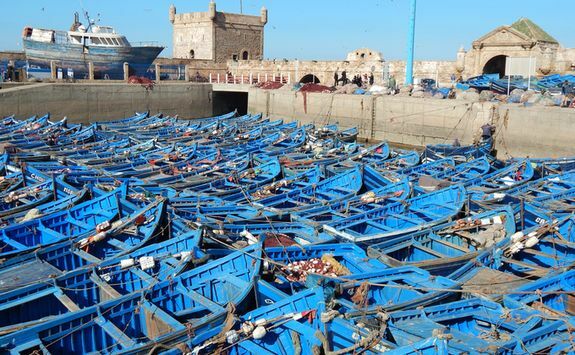 Of course there will also be plenty of time to explore the famous souqs too. 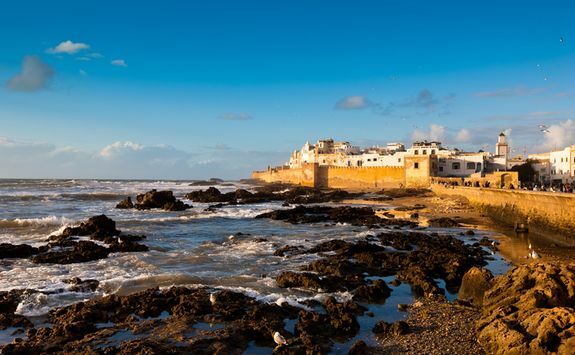 Start your Moroccan adventure in Tangier, the gateway to Africa. 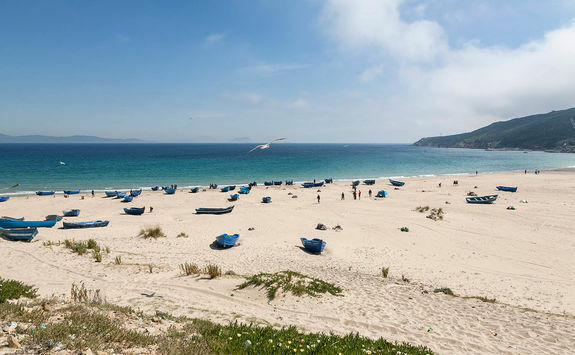 It's just over eight miles from Europe across the Strait of Gibraltar - and one of Morocco's most up and coming destinations with new direct flights from the UK. 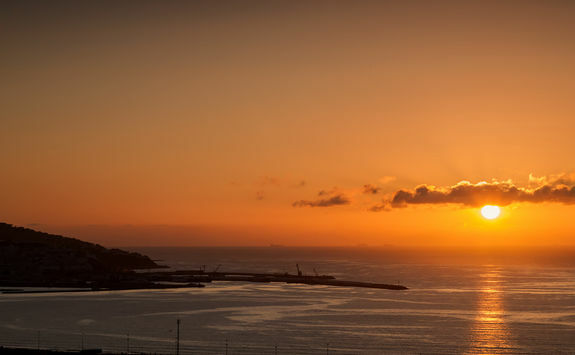 Your driver will be waiting to meet you at the airport arrivals and whisk you to your hotel in under 20 minutes. 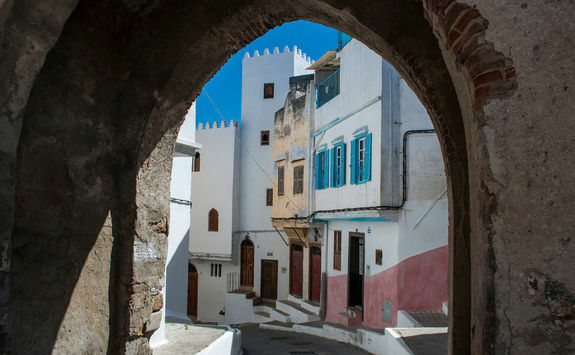 Tangier is busy throwing off its slightly seedy reputation, attracting an eclectic and cool crowd who are giving this city a new lease of life. 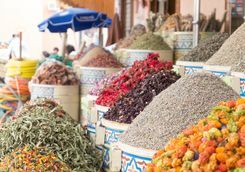 Spend your first afternoon and evening soaking up the atmosphere on the white washed streets and eating and drinking in the sun. 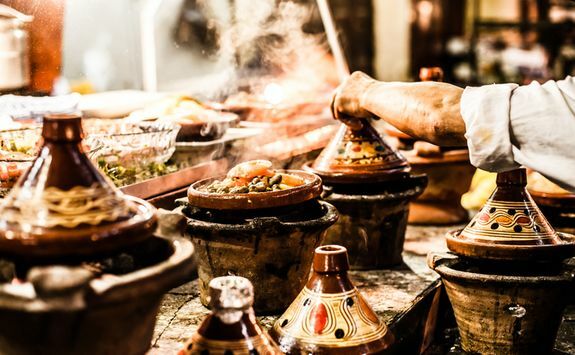 Moroccan cuisine is undeniably good and we will recommend our favourite restaurants in the city. 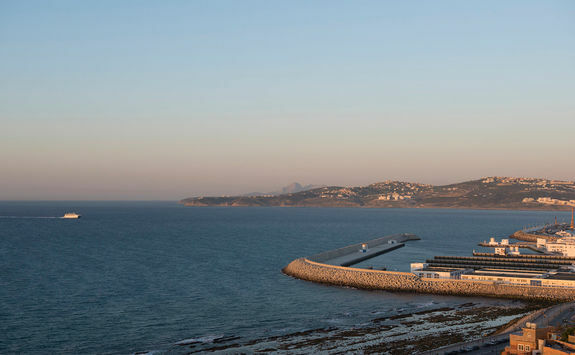 Wake to sea views and a fresh coastal breeze this morning. 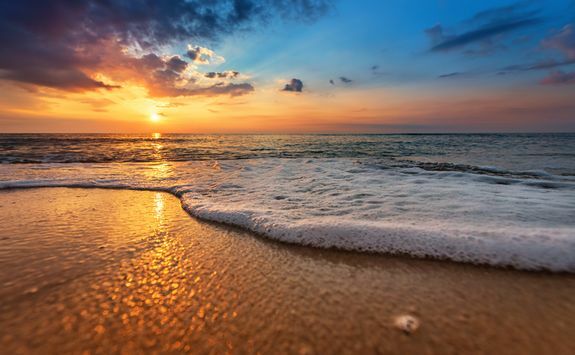 Then, after breakfast, head to the beach for a day spent doing very little in the sun. 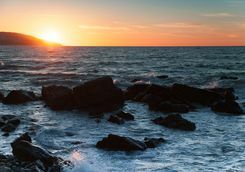 There are a number of available watersports and beach activities to get involved with, or alternatively you might want to just enjoy having the time to sit in the sun with a good book. 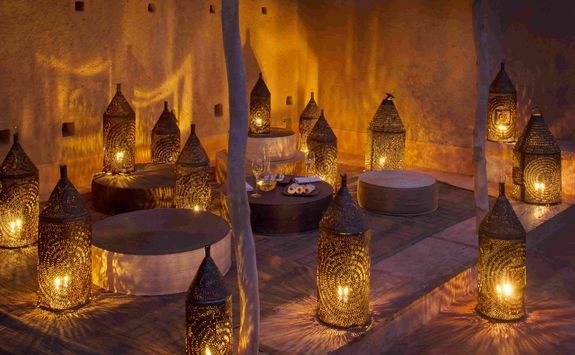 We recommend another evening of leisurely eating and drinking as the next week will be spent at a much faster pace. 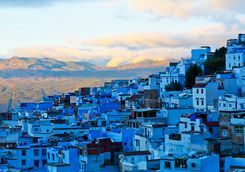 This morning pack the bags and meet your driver for the drive to Chefchaouen, which will take just over two hours and pass through pretty countryside and olive groves. 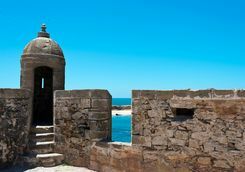 One of our guides will meet you at your hotel just after you arrive and then take you out for an afternoon walking tour. 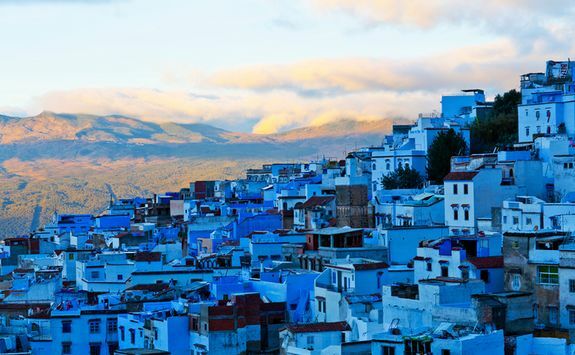 Chefchaouen is a quaint and colourful town perched 2000ft above sea level between the two peaks that gave it its name. 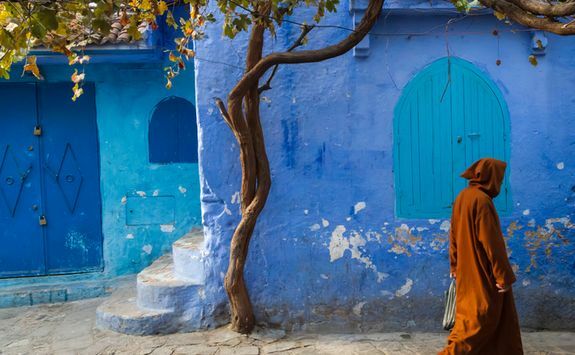 The city is famous for its shady valleys, medina (old town) and perhaps most of all, its azure painted houses. 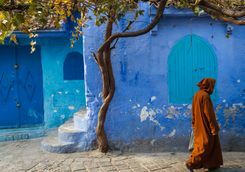 The local markets of Chefchaouen are animated with traditionally dressed locals and colourful shops with beautifully displayed local crafts, so amidst snapping some supremely Instagramable shots, take some time to simply soak up the atmosphere. 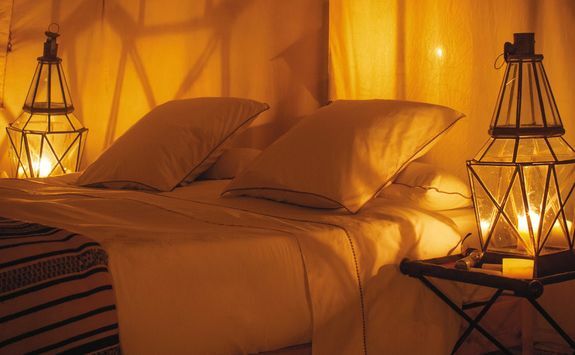 Then, retire to your hotel for dinner and a good night's sleep. This morning it's back on the road, this time headed to Fez. 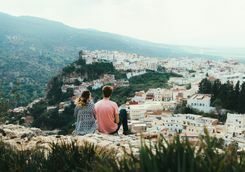 The drive is around three and a half hours but passes through some beautiful countryside; make sure you spend plenty of the journey gazing out of the window at the rivers, olive groves and shepherds with their bright Berber hats. 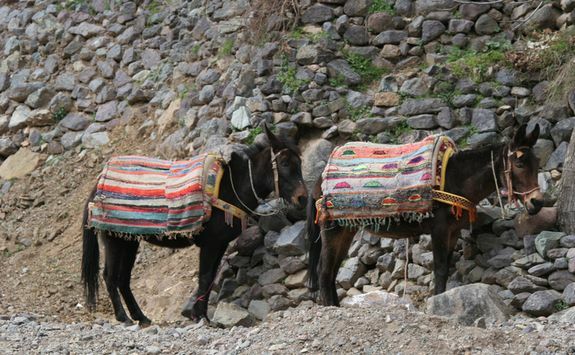 You'll share the road with goats and sheep and of course the odd donkey, usually buried beneath a mountain of hay. 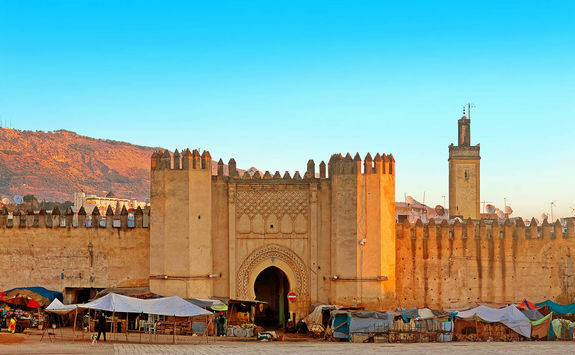 When you arrive in Fez your driver will have to stop the car on the outskirts of the Medina and help you navigate to the riad hotel with your bags on foot. 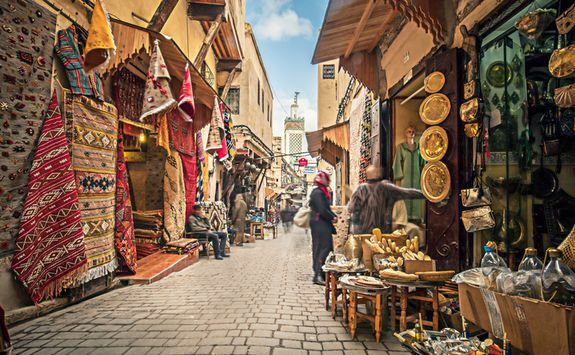 Don't worry though, this is common practice in Fez as the medina streets are far too narrow for cars to fit through. 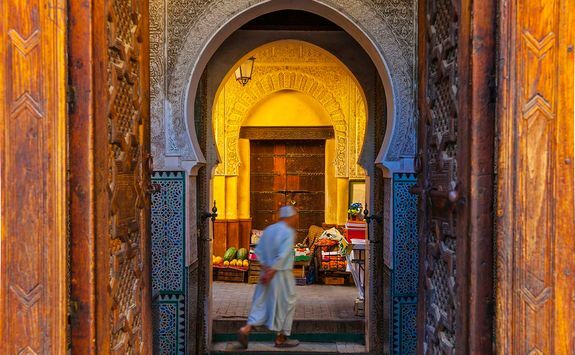 Once settled into your hotel we will arrange for a guide to meet you and take you on an afternoon wander through the medina - we seriously recommend that you do use a guide because it's almost impossible not to get lost here. 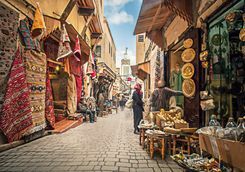 Plus, with a local on hand to offer interesting titbits and take you to the best stalls and workshops you'll get a far greater appreciation of the hustling, bustling life in the oldest working medieval medina in the world. 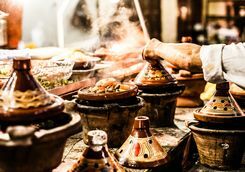 Tonight our detailed destination Dossier should come in handy with recommendations for the best spots to enjoy an authentic Moroccan dinner. 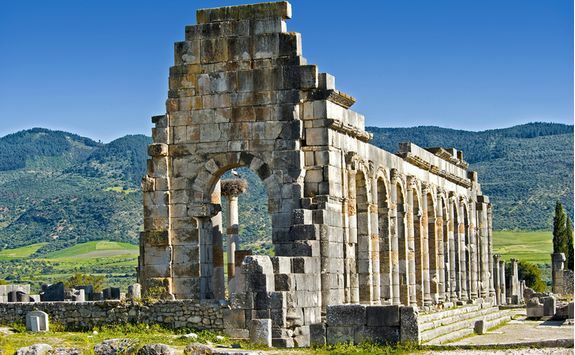 This morning you'll be met by a private guide at your hotel for a full day excursion to the ruins of Meknes and Volubilis. 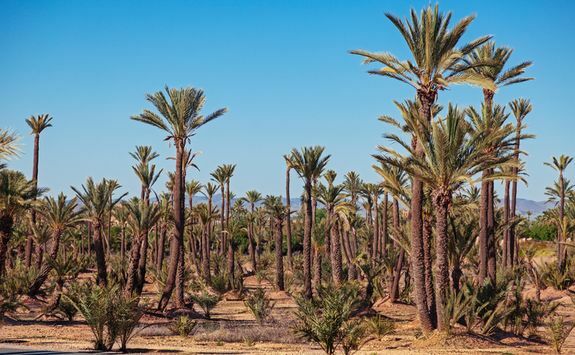 You'll first drive across the Saiss plain for about an hour until you reach the medieval city of Meknes, which was rebuilt in the 17th century to become the King's capital and is now UNESCO protected. 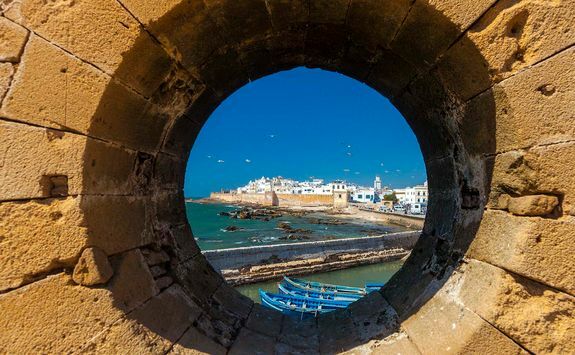 Your guide will take you to see various monuments, including El Heri Souani, the King's grandly designed granary and stables; the mausoleum of Moulay Ismail, with its harmonious Moorish design; and Bab El Mansour gate, the most beautiful in North Africa and an amazing example of tile work. 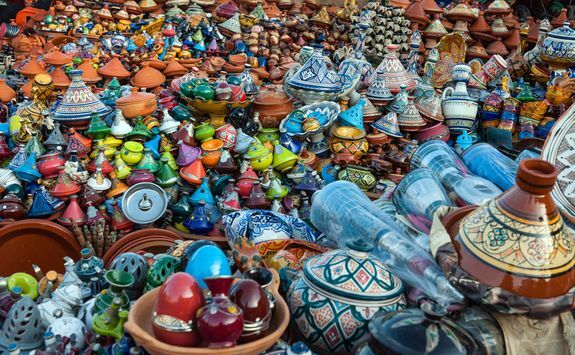 At the end of your visit take a walk to El Hdim square and visit its food market and Dar Jamai Museum. 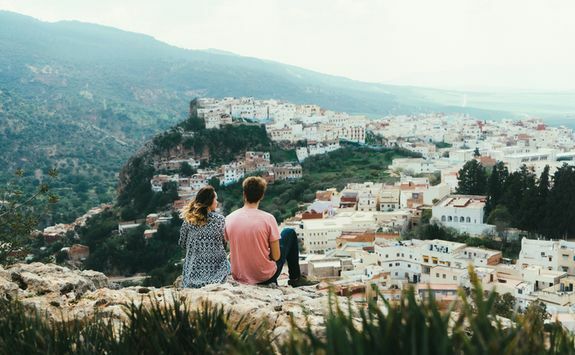 After lunch, drive north towards the mountains of Zerhoun to visit Moulay Idriss, a sacred Muslim town where the first King of Morocco is buried. 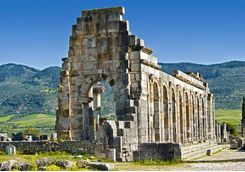 After that, start a walking tour of Volubilis, built over two thousand years ago when this part of the country was a Roman province. 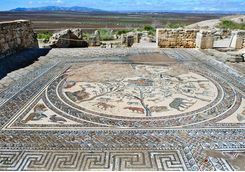 Discovering the Roman part of the Moroccan history, you can admire one of the most beautiful collections of mosaics which have never been moved from their original site since their discovery in the early 20th Century. 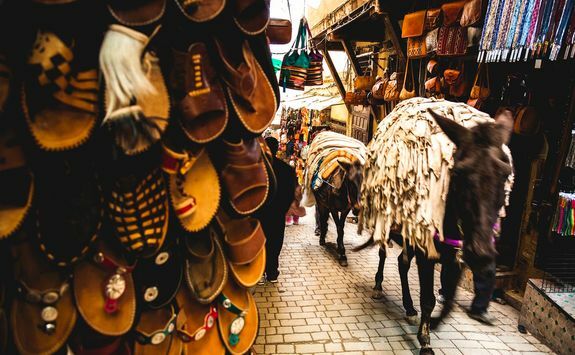 Today you'll leave the medieval medina of Fez for the equally famous souqs of Marrakech. 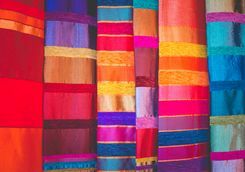 A driver will meet you at your hotel in the morning to help carry your bags to the car which will take you to the airport. 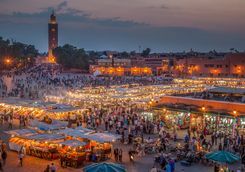 Catch an hour long domestic flight to Marrakech, where another driver will be waiting to meet you and take you to your hotel in the city centre. 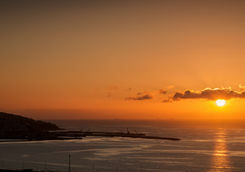 After a busy few days of sightseeing and travelling we thought you might want to take it easy this morning. 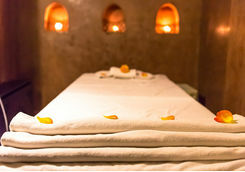 So enjoy a lie in and then spend the morning relaxing and being pampered in your hotel's traditional hammam spa. 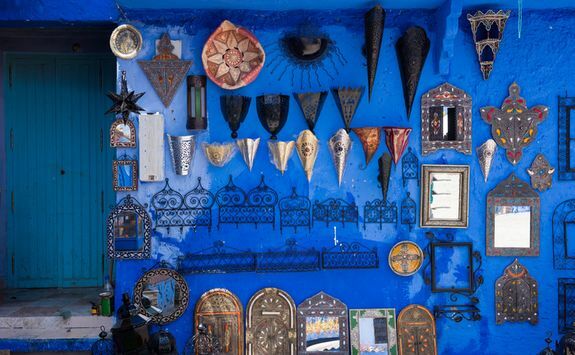 After lunch a guide will meet you at the hotel for an afternoon tour of the souqs and medina. 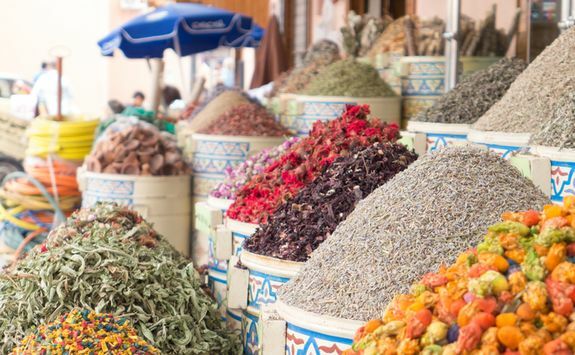 Wandering through the maze of narrow and colourful streets you'll be introduced to the sellers and have the opportunity to taste some local produce, smell the fragrance of the local spices and oils and touch the texture of the local fabrics. 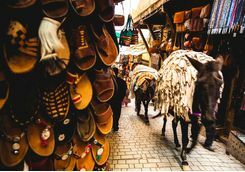 Your guide will be a local and exceptionally knowledgeable on the history and culture of the souqs, and can give you a much greater appreciation of the bustling life here than you would get otherwise. 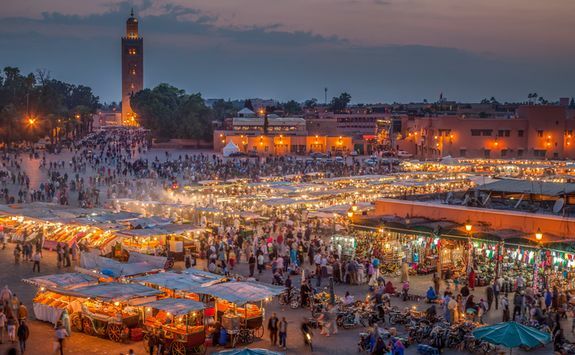 The tour ends at the UNESCO world heritage site, Djemaa el-Fna square, where your guide will fill you in on the fascinating folklore and cultural fascinations present in the city. 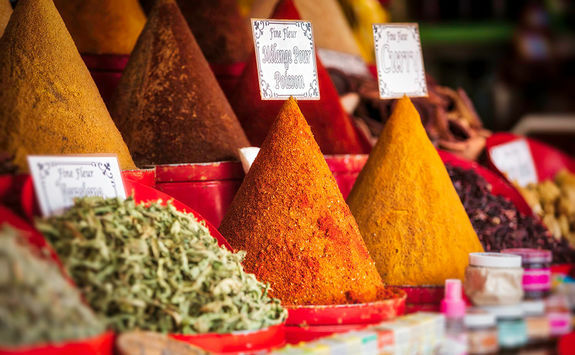 As you listen, keep an eye out for medicine men, fortune tellers, acrobats, and snake charmers. 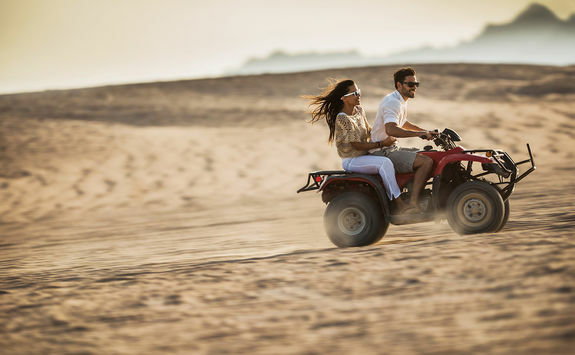 Channel your inner adrenaline junkie today as you head out of the city centre to do some quad biking. 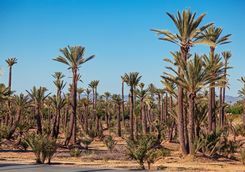 A driver will pick you up and take you to the palm grove of Marrakech, where you'll be kitted up and given full instructions and a demonstration on how to use the quads. 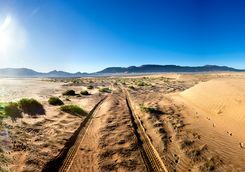 From there you'll hop on and follow your guide through the sandy off road tracks between the palm trees, kicking up sand and feeling the thrill of bouncing over the rocks and dry river beds. 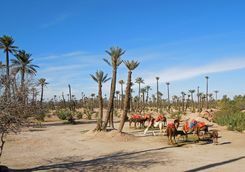 The ride is about two hours long and half way through you'll stop to rest and have a cup of mint tea with some locals. 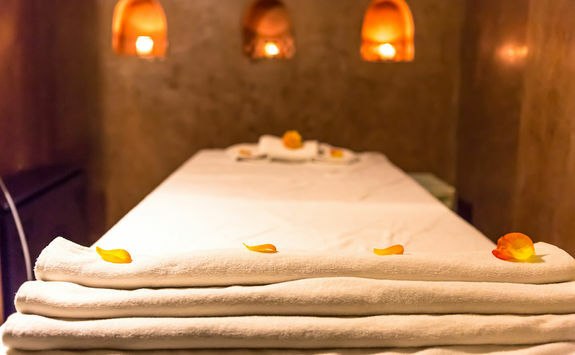 After you're finished you'll be taken back to your hotel where we suggest you might want to wash off all that sand and then soak in the hammam for an hour or two before dinner. 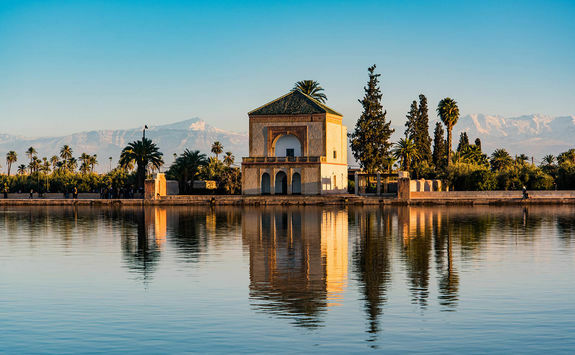 This morning it's time to say goodbye to Marrakech as you head to the edge of the Southern Desert and the luxuriously restored Kasbah, Dar Ahlam. 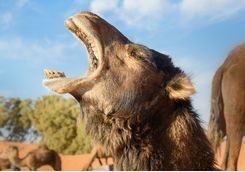 Your driver will collect you from your hotel straight after breakfast as the drive is a fairly long one at four and a half hours. 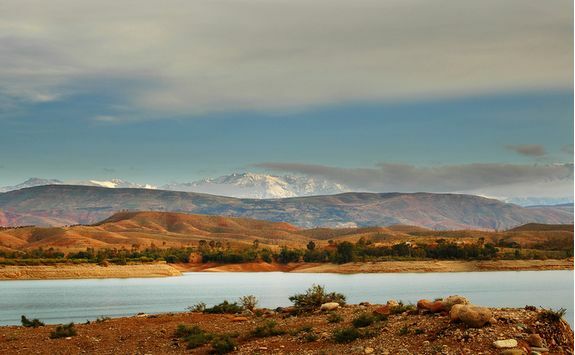 Though, since you'll be crossing the Atlas Mountains, the scenery more than makes up for the hours in the car. 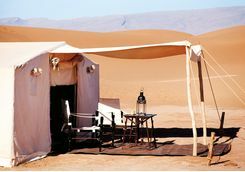 Arriving at Dar Ahlam, settle into your room and let the fact that you are staying in one of the most remote areas of the country sink in. 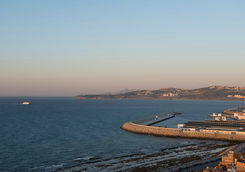 With over 100 staff and just 14 rooms this is a residence fit for royalty, so expect to be pampered. 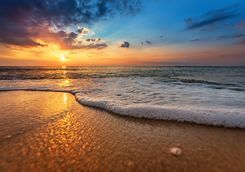 There aren't many times in life that we fully turn off and appreciate simply relaxing, but that is exactly what today is all about. 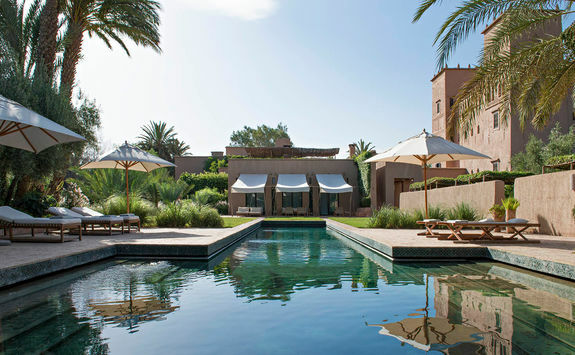 Dip in and out of the pool, sunbathe on the terraces or stroll through the lush gardens. 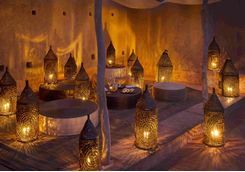 Then, retreat inside the hammam to soak away any lingering stresses before a candle-lit massage sends you into a total zen. 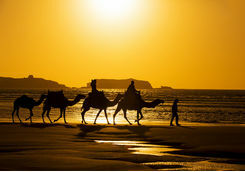 Today you head out into the Sahara for what promises to be one of the real highlights of this trip. 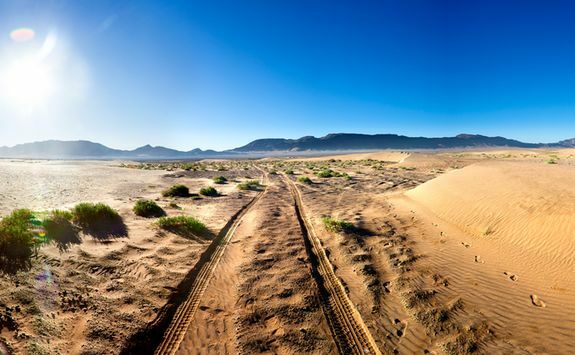 Start by heading into the desert with your guide, then hop out of the 4x4 and channel your inner child as you spend the day racing up and down the rippling sand dunes. 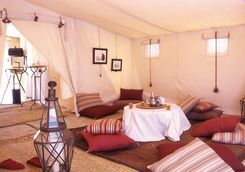 Later that afternoon you'll reach your tented camp. 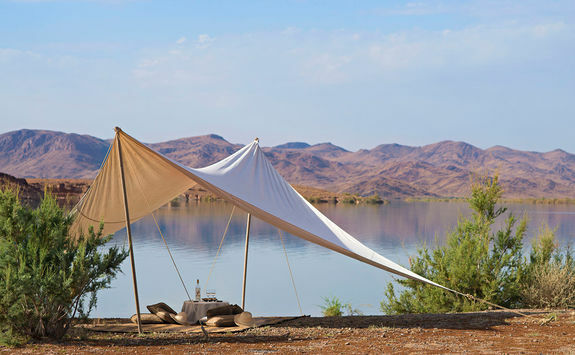 Strewn with African reed mats and soft Berber cushions, the large canvas tents are vintage Moroccan in style and yet extremely comfortable, with proper double beds and en suite bathrooms inside. 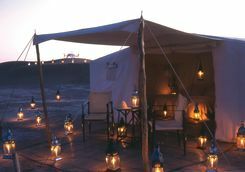 Having settled into your home for the night, climb to the top of the nearest dune and watch the sun set with a drink in hand. 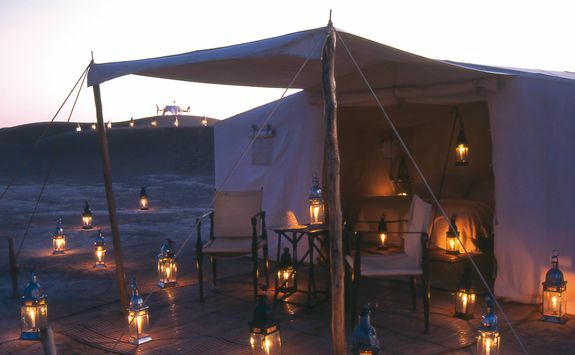 There really is nothing like the complete blissful solitude you'll feel as the light starts to fade and nothing but your lantern lights up the night sky. 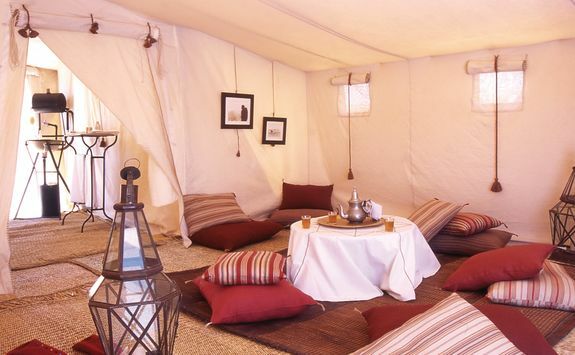 Wander back to camp when you're ready, where you'll have dinner around the campfire. 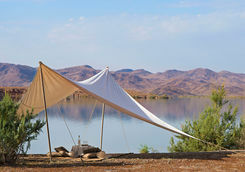 Wake up early this morning to watch the sunrise over the desert while you sip on a hot coffee and nibble at breakfast. When you're ready, head back to the 4x4 and across the dunes towards Dar Ahlam. 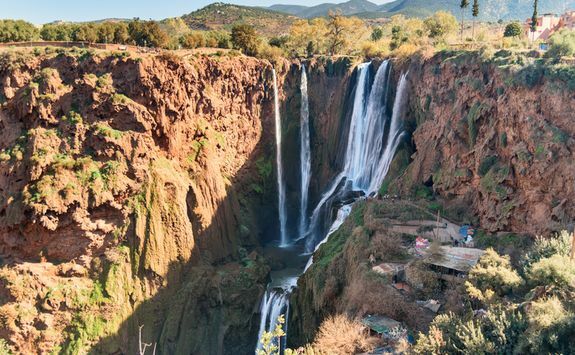 On route, explore among the corn stalks and pomegranate trees of a nearby palmeraie and drive to the hilltop vestiges of a 12th century Berber village for a traditional tea ceremony. 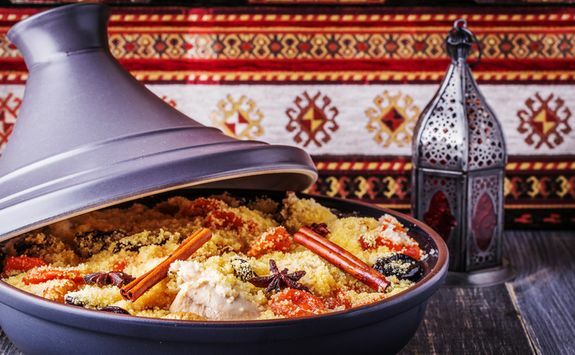 Enjoy a final dinner back at the hotel with ingredients sourced from the gardens and spontaneously crafted into dishes that reflect the mood of the guests. 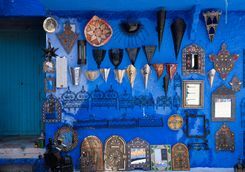 There are no set menus and not even a set restaurant at Dar Ahlam, so feel free to suggest where and what you would like to eat, or let the staff surprise you instead. 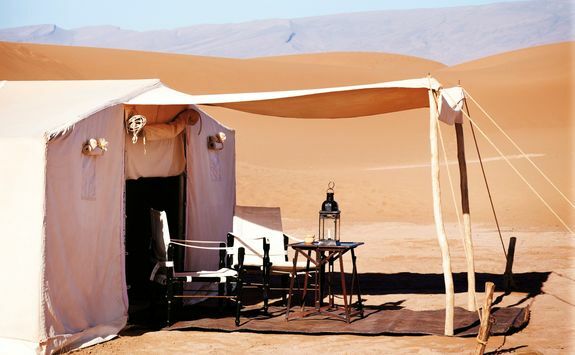 After a few days in the vast open stretches of desert, it's time for a change of scenery. 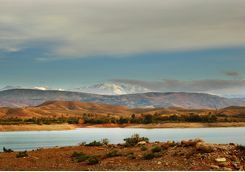 Your driver will be ready to begin the five-hour drive to your Atlas Mountain retreat as soon as you are. 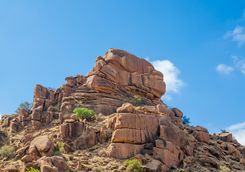 Though the journey is a long one, the scenery is again spectacular and there are many opportunities to get out and stretch your legs for an hour or so as you enjoy the panoramic views. 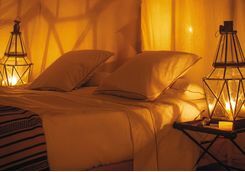 When you arrive at your hotel, enjoy a leisurely dinner and get a good night's sleep as tomorrow will be an active one. 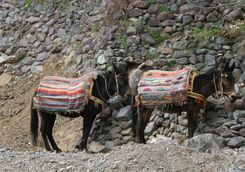 Complete with guide and donkey laden with supplies, head out for a full day of trekking in the Atlas Mountains today. 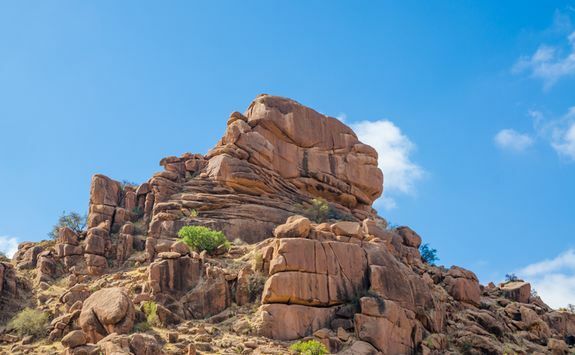 The snow-capped peaks, red rocky outcrops and verdant mountain foliage make for a picture perfect juxtaposition of colours and the views here are just incredible. 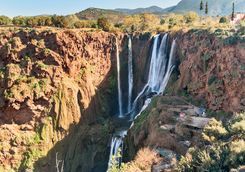 As you traverse the mountain sides look out for gushing waterfalls and little Berber villages where you can stop for a cup of mint tea. 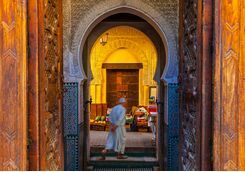 Enjoy a picnic lunch and then continue trekking till late afternoon, when you'll head back to your hotel for dinner and perhaps an evening soak in the hammam. 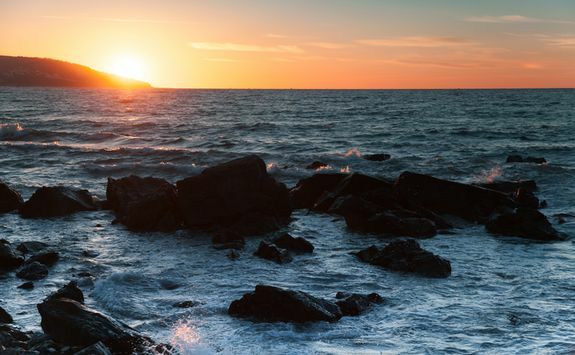 After all the walking you did yesterday we wouldn't be surprised if you're feeling a little sore and tired today. 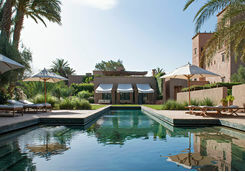 Luckily the pool and the shaded terrace make the perfect spots to relax with a good book and rest any tired legs. 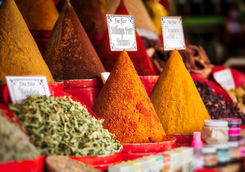 You might also want to join the chefs in the kitchen for a traditional Moroccan cooking lesson. 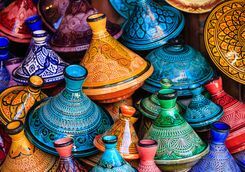 With some of the most flavourful and delicately spiced dishes around, mastering Moroccan cuisine is a real artwork, learn from the masters and then go home ready to impress friends with an authentic tagine. 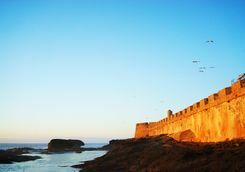 Head to your final destination of the trip this morning with a three and a half hour drive to the coast. 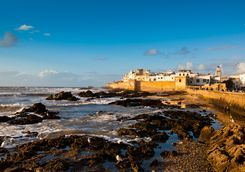 When you arrive in Essaouira you'll be greeted with sea views and a refreshing coastal breeze, so drop your bags and then head out to explore the area. 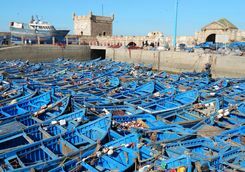 The harbour is a great place to start with its Portuguese styled fort and collection of little fishing boats offering a charming seaside atmosphere that feels more Mediterranean than African. 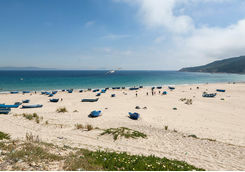 We suggest staying here for dinner where you'll find numerous restaurants offering freshly barbequed seafood. 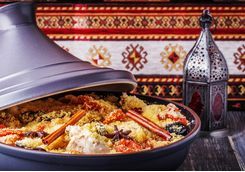 Thanks to the growing popularity of Moroccan food in the UK, a beautifully decorated tagine dish has become something of a kitchen showpiece. 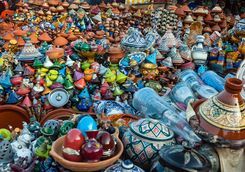 Make sure yours outdoes the likes of John Lewis by today purchasing a hand crafted one on a tour of nearby Safi, the capital of pottery and ceramics in Morocco. 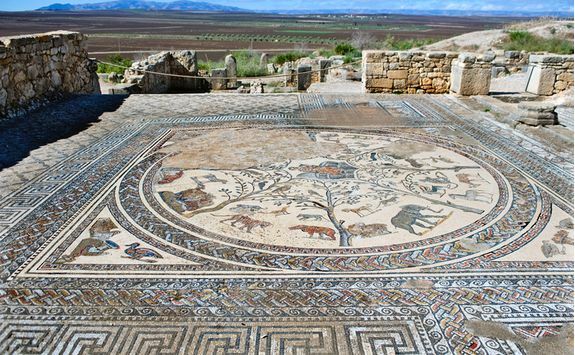 Your guide will pick you up from your hotel and drive you two hours north to get there. 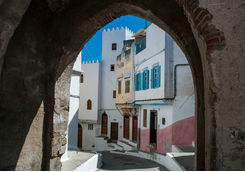 Safi is another Portuguese Moroccan fortified city inhabited by 300,000 people. 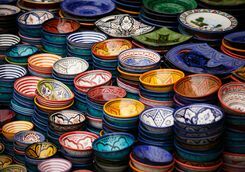 You'll start by visiting the Kechla which is a Portuguese fortress that has become The Museum of Pottery and Ceramics. 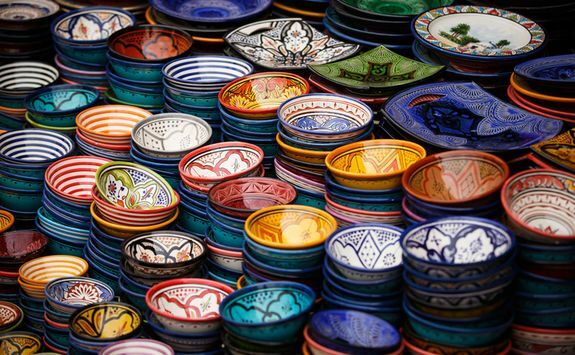 Walk down to the Medina to visit the pottery workshops before you venture inside the streets of the colourful Souks. 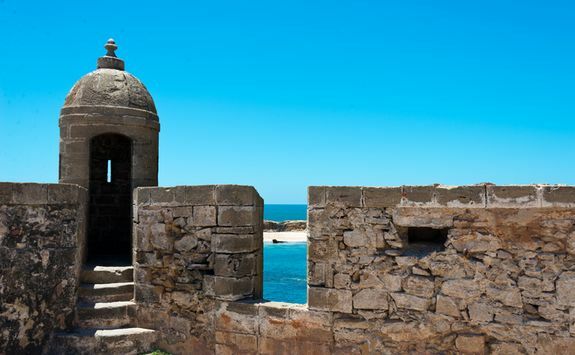 In the afternoon, visit Dar el Bahr, the 'castle of the sea' which is the main remnant of the Portuguese occupation during the 16th century and which was the governor's residence in Safi. 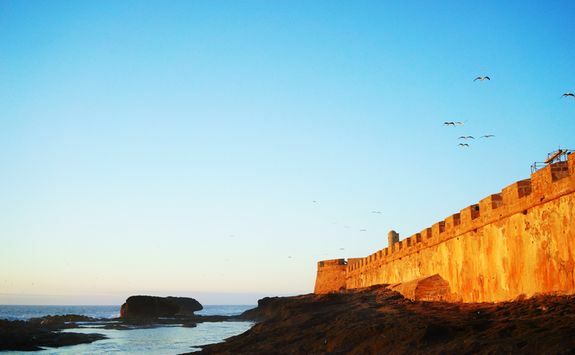 There should then be enough time to wander and shop before your return to Essaouira. 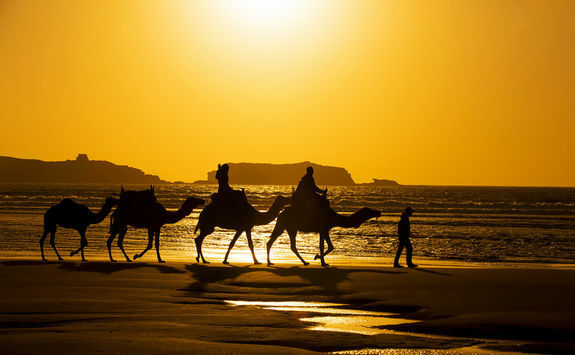 You started this mammoth Morocco trip on the beach, so what better way to end it than on another one. 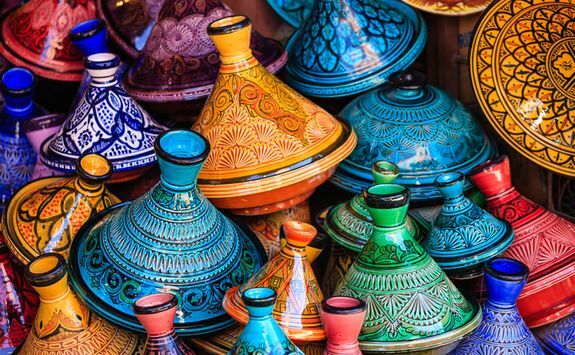 Hopefully feeling like you really have had the ultimate Moroccan experience, it's time to say goodbye this morning. Your driver will pick you up after breakfast for the two and a half hour drive to Marrakech airport. 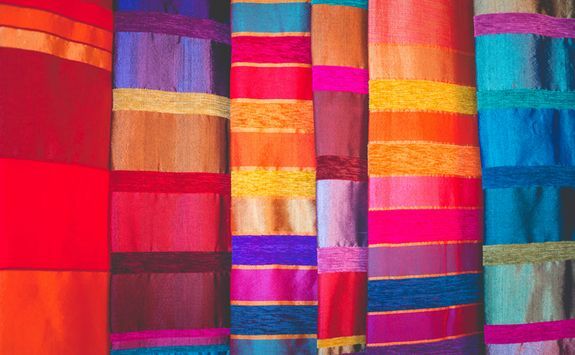 Check in and catch your flight to be home before you know it.